It is the time of year where it is warmer outside the house than it is inside the house. Still, it is not quite painting weather (the blessed shade is less blessed in April than in July), so instead of getting back to the Water Paintings (or following up on the urge to begin some Wisteria Paintings), I finished up another ‘Column Collage’. What we’ve got here is: some sequins cut from an old exhibition poster, part of an oil pastel drawing of sky, some black paper I cut in fringes to match the fringes from a picture of a ‘puffy pillow’ from an old exhibition (Nu:Nar) and in between a watercolor drawing on very thick tracing paper, some more sequins, the edge of the ‘puffy pillow’ picture that shows the beaded seam on the edge over the gold leaf, a bird I cut from a business card (original bird was a painted piece of wood from another painting -the collage got an addition of a yellow breast), an ink-jet print of a photo from Avanos that I printed on Japanese rice paper (and glued down backwards), a bit of a garden watercolor, a bit of a watercolor and ink drawing of an old Chinese cauldron, and a bit more of a watercolor and ink landscape. And what you’ve got here is: more of that bit of watercolor and ink landscape, some photos of some very damaged pavement photocopied (the photos, not the pavement) on light blue paper, a little bit more garden landscape, a drawing based on another drawing of a Hittite clay object from the Museum of Anatolian Civilization in Ankara, a red flower from part of a design for a mosaic tabletop, some bits of an old drawing (red and gold leaf) and photocopies of old sliver leaf-coated drawing paper from another piece (from nearly 20 years ago! 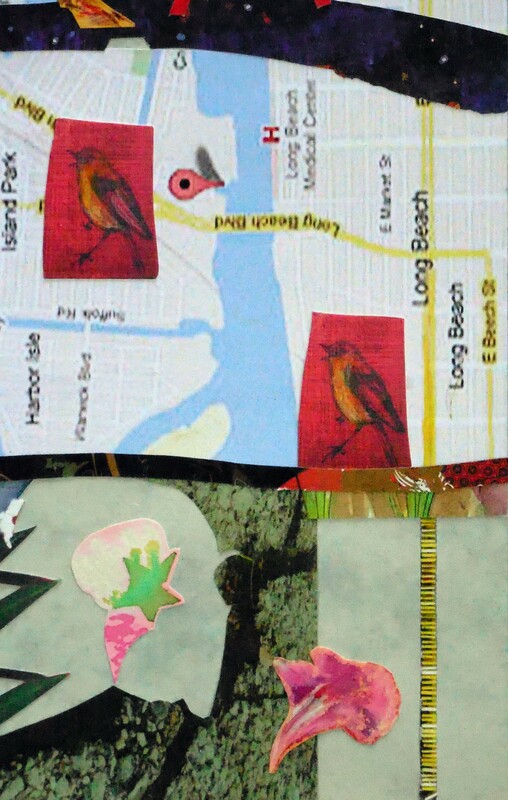 ), a map of Long Beach (I had planned on using in a collage for the installation Homesickness, but never did, and the back of the poster that had the sequins on it. And finally what we’ve got is: some more map, some more birds, some more poster-back, some more pavement, a bit of watercolor ‘gift-wrap-paper’, a pastel drawing of a bit of oleander, a photocopy of bugle-beads that were sewn onto an earlier painting (from 15 or so years ago! 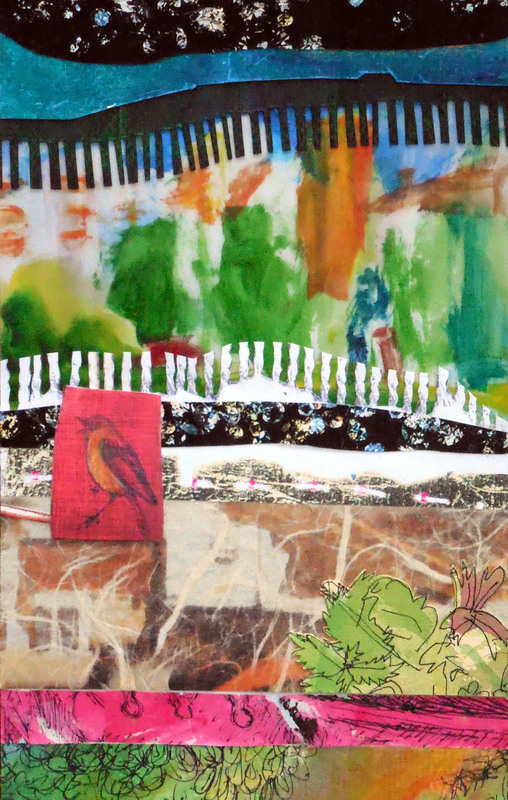 ), and (‘a partridge in a pear tree’ – no, just kidding) a glimpse of the uncovered surface of the marble-patterned paper that everything else gets glued onto! This post is titled Number 10 because this is the 10th of the ‘Column Collages’ I have been making using the paper leftover when I cut the paper for the Water Paintings. 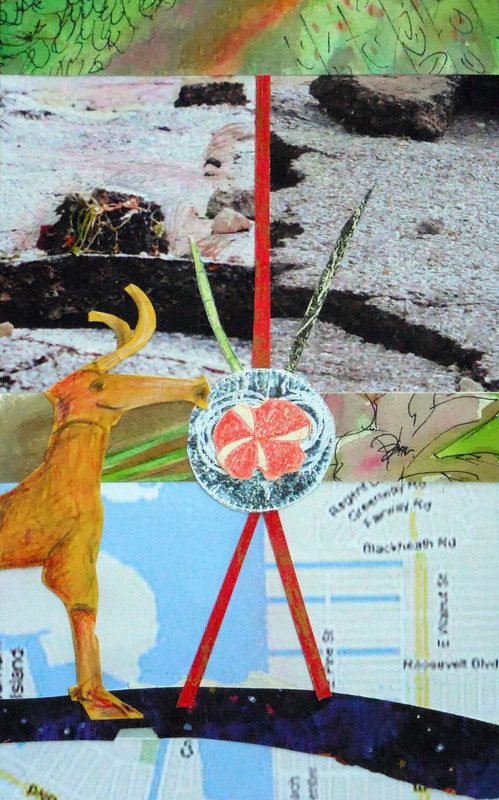 I titled this one ‘Suburban Wilderness’ – Suburban because Long Beach (and Bodrum) is suburban – otherwise it would have been titled Urban Wilderness – because ya gotcha animals, ya gotcha pavement cracks, etc. This entry was posted in Aesthetics, Art, Bodrum, Collage, Contemporary Art, Decoration, Painting on Paper, Uncategorized, watercolour and tagged art, Bodrum, collage, contemporary art, Deborah Semel Demirtaş, Drawing, environment, landscape, mixed media, Painting on Paper, watercolor. Bookmark the permalink.